Cost If purchased alone, STEM Connect is $4,000 per school building per year, but if schools already subscribe to Discovery Education Streaming or are purchasing the streaming service along with STEM Connect, the cost is $3,000. Overview STEM Connect is a curriculum supplement, suggested for use across content areas and grade levels. It provides activities and supporting materials to ­engage ­students in inquiry-based lessons. The emphasis is on problem-solving and learning about science and technology careers. The platform is part of the Discovery Education suite, which also includes digital textbooks and a streaming media service. Ease of use The main navigation page is colorful and appealing, and the layout is fluid and intuitive. On most pages, a collapsing tool bar that expands when users move the cursor over it remains visible on the left side of the screen. Content There are separate STEM Connect courses for grades K-1, 2-3, 4-5, and 6-8, each with eight themed units, such as communities and energy. A course overview is provided for each grade level, outlining big ideas, learning objectives, challenges (showing what students will be designing and making), and suggestions for a wide range of related STEM careers. Within each of the eight units for a particular grade level, users will find a nested menu linking to separate pages outlining phases of the workflow: “challenge,” where students engage with a project and are encouraged to think more broadly; “design,” where they narrow their approach to a solution; and “solve,” in which students develop a test solution and refine it through peer interaction. Subsections within each phase push students to deepen and expand thinking (for instance, under “challenge,” “wonder,” “ideas,” and “explore”). A fourth subsection features additional images, readings, and activities. Most sections include videos, discussion questions, and links to learning objectives. Lessons employ Discovery Education’s “4Cs Framework,” emphasizing communication, collaboration, creativity, and critical thinking. Teacher notes throughout reference these concepts, offer educators tips, and invite them to make connections to other aspects of the lessons. The notes can be hidden by toggling off the teacher presentation mode. Activities are integrated with learning objectives and range from creating word webs and graphic organizers to conducting a “wellness walk” around the school campus and building a solar cooker. The framework could easily be used to support project-based learning or guided inquiry design initiatives, especially in schools where strategies are already in place but there is a need for content and activities. Numerous connections are offered across content areas, with constant reference to science and technology and to real-world problems and solutions. Academic units maintain common themes across grade levels (digital citizenship, health, water). They begin with foundational lessons and become progressively more complex and age-appropriate in sections for older students. Student and teacher resources An interactive glossary pops up in a separate window. Many of the more difficult vocabulary words in the lesson text link to glossary entries. Other in-browser tools include graphic and scientific calculators, a unit converter, and a whiteboard with drawing and graphing tools. For teachers, each unit features a model lesson with a detailed outline, including learning objectives for both teachers and students, key vocabulary, and more. There are a number of interactive tools for educators, such as an assessment builder and assignment builder. A classroom manager and assignment manager allow teachers to keep class rosters and grades organized. A potential downside is the time investment required to set up classes and student accounts at the outset. 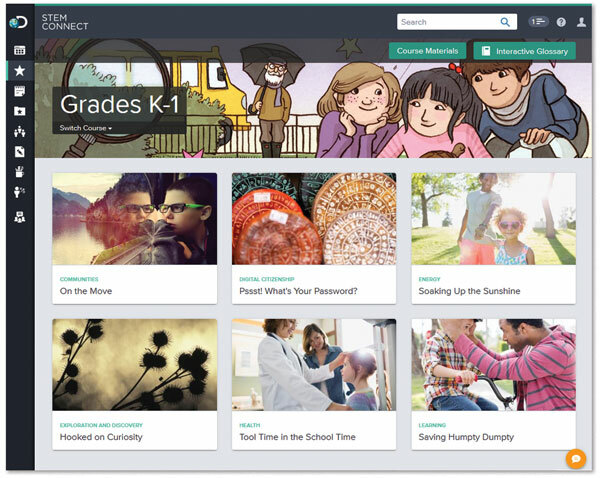 A “My Content” tab allows instructors to curate favorite lesson elements from elsewhere on the site or to upload resources for use in creating assignments. A “Professional Learning” page includes links to user guides outlining the instructional design and offering simple steps for navigating the site and making use of the content. There is a link from the main menu to the Discovery Educator Network, the online community of Discovery users. Verdict While there is a learning curve involved with acclimating to the format of the lesson units and some setup for structuring student accounts for assignments and assessments, the layout and instructional design are straightforward and clear. In addition, the writing is lucid and informative, and images and videos, original Discovery content, supplement and amplify the text. The cost is relatively high and will be prohibitive for many schools. But for those with the budgets to support it, STEM Connect provides engaging and adaptable unit planning materials for inquiry-based STEM learning.